Late in 2018 and still continuing in 2019, Foundation for Life and the Right to Life Action Coalition of Ohio are filing complaints with the Ohio Department of Health and other agencies in an effort to bring the forefront issues with the operations of Capital Care Network. Legal groups are involved, like Thomas More Society, and these are the first steps to bringing about change in operations, and eventually, the closure of this deplorable facility. Visit www.protectlifeinthe419.com for more information about the the abhorrent conditions at Capital Care Network. CCN Update – Since the announcement Wednesday, April 25, 2018, by the Ohio Supreme Court denying Capital Care Network’s motion for reconsideration, finally exhausting CCN last legal appeal, the question pro-lifers are asking is where do things stand? 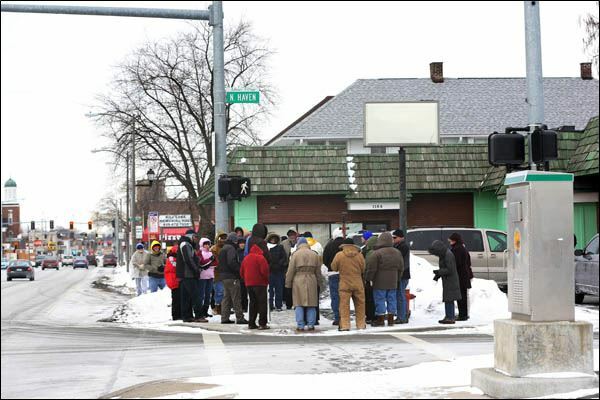 What are the practical realities regarding Toledo’s last abortion clinic? Well, CCN’s license to perform surgical abortions has been revoked. Regrettably, they can still administer chemical abortions and that is why they remain open. The Ohio Attorney General’s office has recommended that CCN be required to apply for a new license (as opposed to having their old one reinstated) and every major pro-life organization around the state has concurred with that recommendation. Now armed with a Transfer Agreement from ProMedica, Toledo’s last abortion clinic has submitted an application for a new license with the ODOH even before the Ohio Supreme Court ruled on their motion for reconsideration. We are advocating that CCN’s application for a new license be put on hold until such time as a verdict is reached on their outstanding fine of $40,000. The Ohio Department of Health (ODOH) is now just getting around to holding a hearing requested by CCN appealing their $40,000 fine. (A fine that ODOH leveled in August of 2017.) The hearing will take place on June 27, 2018. ProMedica’s recent decision to grant CCN a Transfer Agreement goes contrary to President Oostra’s (Continued from eblast)...public position that the hospital had subscribed to for years, that the hospital stands ready to provide the best healthcare to any patient in need of emergency care. Then the ProMedica’s Board took it upon itself to impose a position contrary to President Oostra’s longstanding position of not taking a position in support of abortion. The decision to give CCN a Transfer Agreement was made in haste and in secret. It was not made in an open dialogue among the Board Members where a decision of this magnitude should be made. 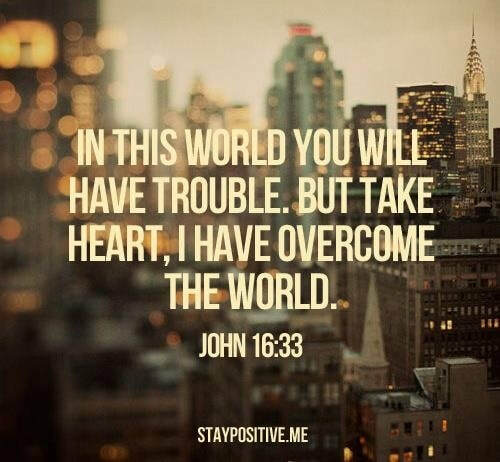 Where all sides are given the opportunity to vet this life impacting resolution. Where members have to vote their convictions openly among their peers. No, instead the ProMedica Board of Directors, under a cloak of secrecy, narrowly voted to order President Randy Oostra to provide CCN with the needed Transfer Agreement, thus enabling CCN to reopen as a surgical abortion provider. FOR IMMEDIATE RELEASE, April 25, 2018 (Toledo, OH): Today, the Ohio Supreme Court announced that it would not reconsider it's decision that enforced Ohio's transfer agreement rules for all Ambulatory Surgical facilities, including abortion mills. It is imperative that the Ohio Department of Health immediately follow through on its original revocation order against Capital Care Network. Capital Care Network must reapply for a license and pay its $40,000 fine before aborting anymore innocent lives. The Ohio Department of Health is obligated to uphold the rule of law and not give Capital Care Network any further leeway to remain open under any circumstances. Email the Ohio Department of Health and encourage them to enforce their original license revocation: Director@odh.ohio.gov. Sign the petition telling ProMedica that Abortion is not Healthcare and to withdraw from the Transfer agreement with Capital Care Network. Our goal is 10,000 signatures and we are at 9,500. If you have already signed, please encourage others to sign as well. Pray that ProMedica Board Members will have a change of heart and vote to revoke the Transfer Agreement with Toledo's last abortion mill. 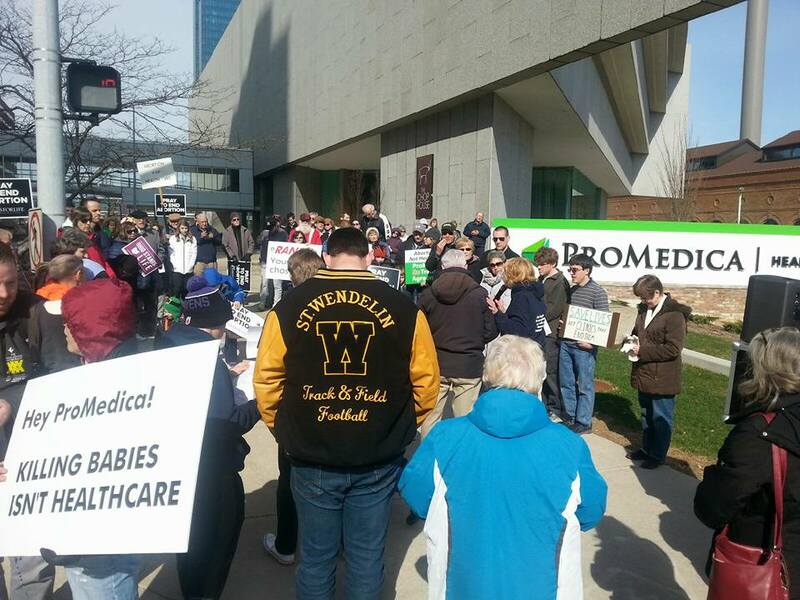 Protest at ProMedica Headquarters on April 2. 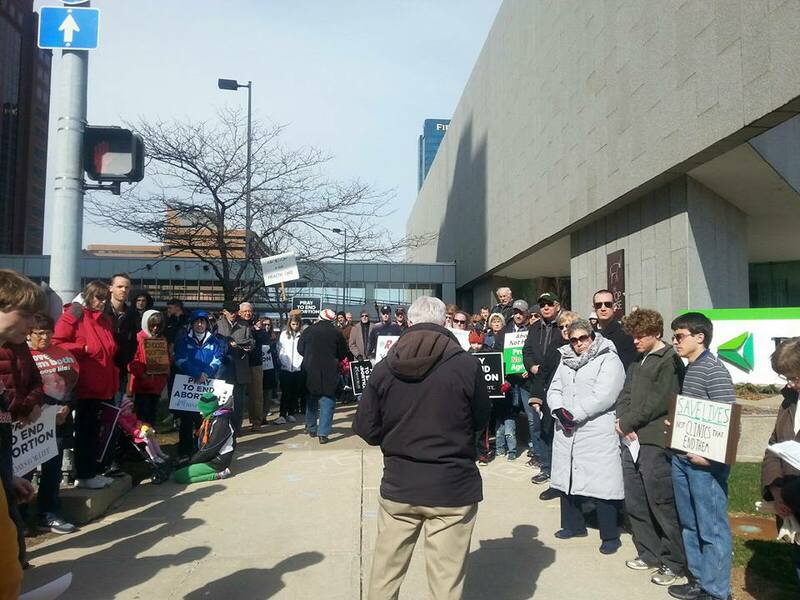 150 people showed up to demonstrate their disappointment with ProMedica's decision to have a transfer agreement with Capital Care Network. More demonstrations planned! Get involved and help us make the point that ABORTION IS NOT HEALTHCARE. UPDATE Please act quickly and sign this petition immediately! Even though ProMedica has officially entered into an agreement with Capital Care Network, we must still stand strong in our fight for life! Please let ProMedica know that a prestigious HEALTHCARE provider should not parter with an abortion clinic to END LIFE! Let our voices be heard. It is NOT TOO LATE to tell ProMedica to choose LIFE! Sign the petition if you believe a health provider should not support a facility that ENDS life rather than SUSTAINS it. There is still time to impact this decision as the Ohio Supreme Court considers the appeal from CCN regarding the status of their license which was revoked in the decision on Jan 26. Health Violations (see check my clinic website for reports on violations dating back to 2011) All of the inspection reports on this site were acquired through public records request to state departments of health and public records online. It was reported that the Ohio Department of Health notified the Capital Care Network abortion clinic in Cuyahoga Falls Ohio on March 5, 2013 that it could no longer perform surgical procedures. Deficiencies found during an inspection from February 2013 included allowing under-qualified staff to administer drugs and using patients’ blood without their knowledge. This is what they said to justify their decision to make the agreement. FOR ALL EXCEPT THE UNBORN! Is this the health-care you want to take care of you and your family? This clinic has been in violation for the past 4 years. How many babies will die here - over 1100 a year! How many women will suffer from the physical and mental impact of having an abortion? Please continue to PRAY that this tragedy will end in Toledo. The Ohio Supreme Court has ruled that because Capital Care Network of Toledo violated a standing rule of 21 years requiring all ambulatory surgical facilities to have written hospital transfer agreements to facilitate emergency treatment, the Ohio Department of Health was within its rights to revoke the clinic's operating license. of Health's position that Capital Care Network's agreement with the University of Michigan Health Center in Ann Arbor, some 50 miles away, does not satisfy the state's legal requirement that it have an emergency patient transfer agreement in place with a local hospital. The Court ruled 5-2 to reverse lower court rulings that had sided with the abortion clinic. It noted that Capital Care had been without a written transfer agreement with a local hospital, as defined by Ohio Law, since August 1, 2013. "This is what we wanted all along - the courts to uphold the law and afford the same medical safety standards that apply to any other ambulatory surgical facility" said Ed Sitter, Executive Director of Foundation for Life. "We can't have lower health and safety standards because this is an abortion facility. Women's health & safety is still a priority." "This is a win for women's health, it's a win for the rule of law and hopefully, it's a win for the unborn, as women have more time to make an informed choice" Sitter went on to say. In a separate case filed by another clinic, Pre-Term Cleveland, the court found that the clinic did not have standing to challenge the emergency transfer law or restrictions on abortion enacted in recent years through the budget process. The Court found that the clinic had not shown that it "suffered or is threatened with direct and concrete injury in manner or degree different from that suffered by general public..." . The majority found that it was not necessary to jump to questions of whether the General Assembly acted constitutionally in cementing a prior administrative rule into state law because the clinic had already violated the administrative rule. Joining Justice O'Donnell in the majority were Sharon Kennedy, Pat Fischer, Pat DeWine, and Judith French. Chief Justice Maureen O'Connor, and recently resigned Justice William O'Neill, dissented. 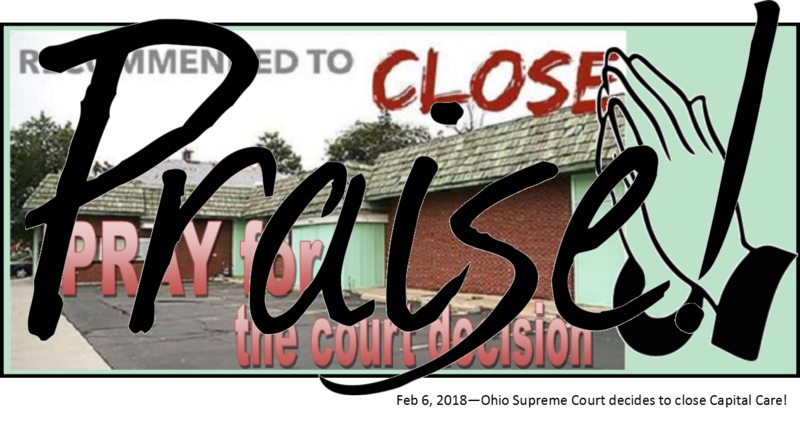 Update on Toledo’s last abortion facility Capital Care Network (CCN). Many have asked when we can expect a decision from the Ohio Supreme Court on CCN. The Court has up to six months from the hearing date, which was on September 12, 2017, to announce its decision. Officially the Justices can take 4-6 months to render a decision, but the time frame is affected by a number of factors, including the complexity of the case and how many justices have decided to write concurring or dissenting opinions in the case. Given that, we can expect a decision no later than mid-March. So keep the Ohio Supreme Court in your prayers. ​As for Toledo City Council taking up the buffer zone ordinance (freedom of access to health care as it was erroneously called), there is another piece of good news. We can have a high degree of confidence that the new leadership on Toledo City Council are not at all supportive of Steven Steel’s proposed anti-free speech/buffer zone ordinance. This will insure that those women and men who weekly give sacrificially to devote their time trying to offer women a life line will go unrestricted. February 14, 2018 ProMedica signs the transfer agreement with Capital Care, thereby allowing the abortion clinic to stay open.